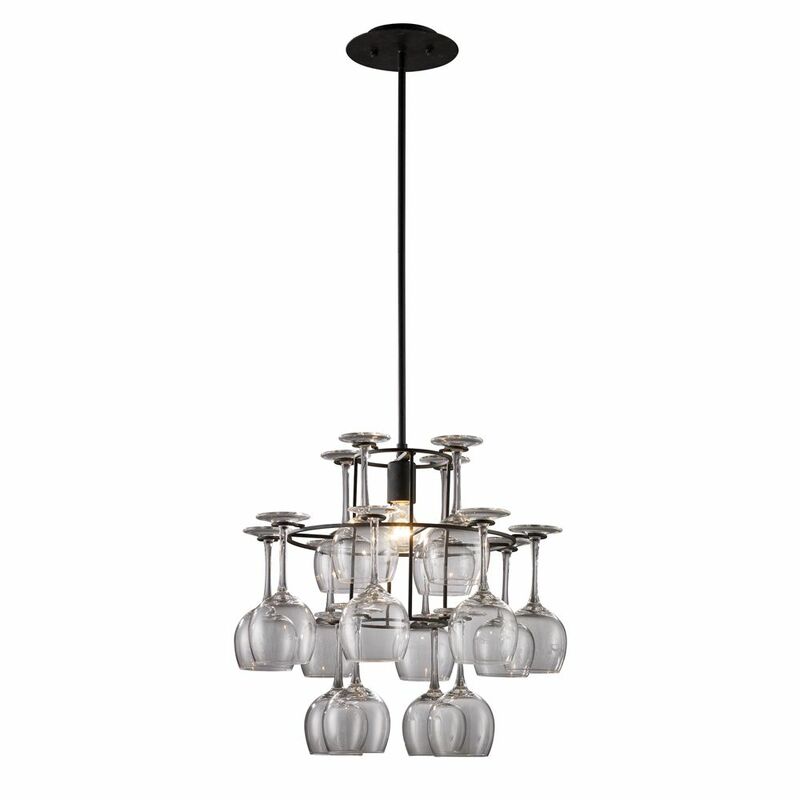 Turn your wine glasses into an attractive lighting fixture with this chandelier. Made from wrought iron, this item is finished in Dark Rust or Aged Silver. Includes 16 wine glasses. All products sold by Titan Lighting are warranted to be free from defects in materials and workmanship for a period of one year from the date of invoice. For any inquiries call 1-800-613-3261. A stunning example of mid-century modern design, the Aldred Branch Chandelier utilizes lines that flow harmoniously with each other to create an instant conversation starter and a room finishing design. Included round bulbs sit at the end of straight arms to create uncluttered, sleek lines with both organic and geometric forms. A true statement piece, the bold brass color brings an air of drama into your room and is the perfect finishing touch to a variety of interior design styles. Emulates Simplicity Of Form And Clean Lines Inspired By The Mission Period. This Was A Time For Craftsmen To Purify Over-Excessive Ornamentation Revealing The Forms That Lie Beneath. The Warmth Of Tan Mica Shades And An Aged Bronze Finish Adds To Its Character. This Botanical Bouquet With Italian Inspiration Is Roped Neatly To Provide Rustic Tranquility. This Collection Embodies Juxtaposed Diversity; Forged Iron Workings In An Aged Bronze Finish, Offset By Soft Tulips That Are Mouth Blown And Hand Tooled. This New-Age Renaissance Collection Graces The Home With Accents Inspired By A Moon Lit Stroll Along St. Paul's Cathedral. The Extraordinary Cohesiveness Of This Collection Captures The Grandeur And Grace Of An Era When Art And Architecture Were As One. The Captivating Lines Of The Dark Bronze Or Queen's Ivory Finishes Accented By Brilliant 32% Lead Crystal May Adorn The Grandest Of Settings. 1-Light Ceiling Mount Dark Rust Chandelier Turn your wine glasses into an attractive lighting fixture with this chandelier. Made from wrought iron, this item is finished in Dark Rust or Aged Silver. Includes 16 wine glasses. 1-Light Ceiling Mount Dark Rust Chandelier is rated 5.0 out of 5 by 2. Rated 5 out of 5 by Becky612 from Sophisitcated Lighting We installed this wine glass chandelier over the stairway leading to our wine cellar and we couldn't be more pleased! The appearance and quality exceeded my expectations! We couldn't be more pleased! !